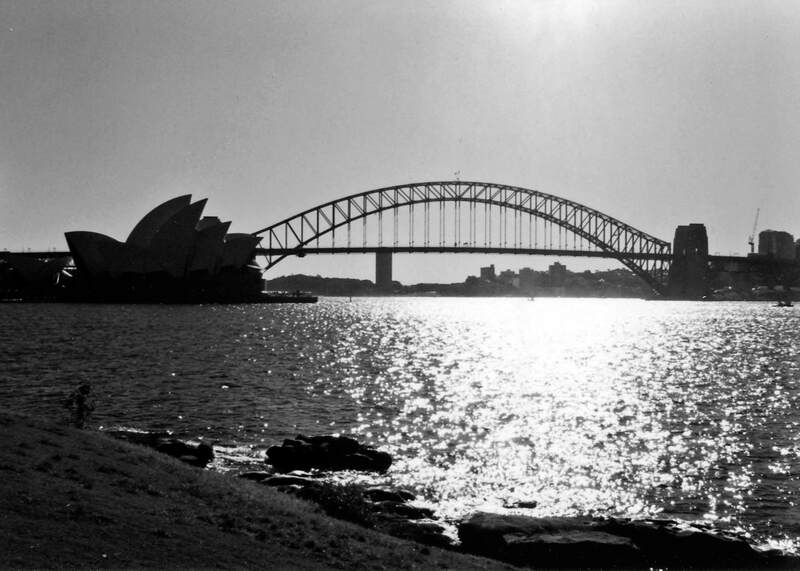 Sydney Opera House and Harbour Bridge, photographed from Mrs Macquarie’s Chair. Two of the most distinctive and iconic structures anywhere in the world sit just a couple of hundred metres apart in the centre of Sydney. The Sydney Harbour Bridge was completed in 1932, with a 503-metre long arch which remains the fifth longest spanning-arch bridge in the world (the three longest have all been constructed since 1977) and the longest in the southern hemisphere. The Sydney Opera House was commissioned from a competition-winning design by Danish architect Jørn Utzon in 1957. It eventually opened in 1973, ten years behind schedule and 14 times over its original budget, with Utzon having notoriously left the project under a cloud never to see his finished work in the flesh. We have been to Sydney twice: the first time on our honeymoon in 1997, the second five years later for New Year’s Eve. First time around, our five days in the city were a whirlwind of newlywed wonder, not least because it was the first big trip we had done together on our own. The memories are too numerous to mention but many of them involve places in and around the harbour: walking up to and across the bridge for the very first time; taking the ferries to and from Circular Quay; strolling round the harbour towards the Opera House along the Australian equivalent of the Hollywood Walk of Fame, passing various musicians and street artists as we went; the tour of the Opera House itself. Other recollections spring readily to mind whenever I see the photo above, a print of which hangs on the wall in our living room. Waking up every morning and eating breakfast on the balcony of our hotel room with its view of the Harbour Bridge and Opera House. Some great food experiences at restaurants such as Edna’s Table (now sadly closed, it specialised in modern takes on traditional Australian foods) and the Darley Street Thai. A fantastic day spent touring wineries in the Hunter Valley (a well-lubricated day spent with a couple of American cargo pilots on layover). Taking a tour of the Sydney Cricket Ground. Being woken up at 3am by a fire alarm and being forced to walk down 14 flights of stairs to huddle in the street outside. Losing a camera and credit cards in the back of a cab. (Oops.) And generally just having the time of our lives. Our return in 2002 – a flying three-day visit en route (well, not really) from Perth to Kuala Lumpur – was for the specific purpose of being part of the New Year celebrations, Sydney being the first truly major city to see in the new year by virtue of being ten hours ahead of GMT. And Sydney certainly knows how to throw a party. A million people gather at vantage points around the harbour from early in the day on New Year’s Eve. We started at lunchtime down by The Rocks surrounded by a contingent of the Barmy Army – fans of the England cricket team – who had arrived in the city in advance of the Test match against Australia which was due to start two days later. By early evening, we decided to up sticks and seek out a spot at the Royal Botanic Gardens instead, to afford us a better view of the celebratory fireworks. It certainly didn’t feel like it as we secured ourselves a tiny patch of available grass, but numbers in the city were apparently considerably down that New Year’s Eve versus previous years, coming as it did barely ten weeks after the Bali terrorist bombings which killed 202 people, 88 of them Australians. The mood was further dampened when the early fireworks show – scheduled for 9pm so as to be family-friendly – was cancelled due to 90kph winds, with a similar threat hanging over the midnight edition which caused a ripple of discontent. But go ahead they did, with a spectacular display which featured an animated dove on the Harbour Bridge and ended with the word ‘PEACE’ spelt out across its famous arch. As a mass shared experience, I have never witnessed anything like it either before or since. How often do you get to share a moment with a million people? The following day we went to Bondi Beach. Only in Sydney. Posted in Travel, Travel memories and tagged Australia, Sydney, Sydney Harbour Bridge, Sydney Opera House, Travel. Bookmark the permalink.